The Extreme Q by Arizer, the herbalAire Elite by herbalAire, and the Vapir Rise 2.0 by Vapir are three of the best multi-purpose vaporizers. All three of these vapes can be used with both a whip and a bag. They all have fans to fill up bags, they all have whips, and they all plug into the wall. However, that is pretty much where the similarities stop. They all look very different, operate differently, and have their own benefits and drawbacks. Neither unit is exceptionally better than the other, so it really comes down to what you want out of your vaporizer. If you’ve seen our other comparison pieces, you will know that we like to break down each major category of the vaporizers and highlight the key points of each unit in those respective categories. By the end of this article, you should have a good idea of which particular unit is best for your situation: The Extreme Q, the herbalAire, or the Vapir Rise 2.0. If you’re looking to purchase any of these units, we recommend buying them from Vaporizer Chief. Not only is Vaporizer Chief very reputable, but they have some of the lowest prices online and also offer Free Shipping and other Free Gifts with your purchase. The Extreme Q is a fairly simple vaporizer to use overall. You just plug it in, turn it on, load up the bowl, and you are ready to go. Just plug either the whip or the bag into the Cyclone Bowl and vape away. All you have to do for the whip is hit it like you would any other smoking device, and with the bags you just turn the fan on high and turn it off when the bag is full (about 90 seconds). Loading the Extreme Q can be complicated for some though, because it works much better when you load it into the glass elbow instead of the Cyclone Bowl that comes with the unit. This involves sucking up your herbs into the elbow before you load it and cranking the vape to higher than normal temperatures. There is a great video of how of load the elbow below. Because the temperature of the heating element is slightly less than the temperature of the air passing through your herbs, you have to set the unit to higher temperatures than you would normally use for vaping. I personally find all of these techniques to make the Extreme Q vape better a bit more of a hassle than the other 2 units we’re comparing here, because while the actual drawing of vapor out of the whip or balloon is easy, there is more prep than the herbalAire Elite or the Vapir Rise 2.0. However, after loading it a few times by following the technique in the video I posted above, you will get the hang of it and it’s actually pretty simple. The herbalAire Elite is the easiest vape of the three to use. You simply plug it in and set the temperature to 350⁰F to start (this unit tends to run hotter than normal), and then you load up your “crucible” piece with your herbs, pop that in the vape, then attach the whip and you can vape away. As far as bags go, you just need to plug the bag into the top and plug the pump into the unit. This is the major downside of this vape: Because the pump isn’t inside the unit, if you want to do bags you always have to have this extra piece to plug in. The herbalAire is a bit different in how it is loaded as well, as you don’t have to grind your herbs at all. In fact, the company actually states in the manual that you should not grind your herbs at all. I have found that, while I tend to use more material because I do not grind my herbs, the flavor is very good. The Vapir Rise 2.0 is somewhat of an odd vape. When you plug the unit in, the vape will go into stand-by mode and the fan will move slowly. To begin vaping, you have to set your temperature and hit the heat button. The old version had to have the fan constantly running, but in the new version they fixed that. Now it performs just as well as the other vapes. However, loading it is easy. All you have to do is load up the herb chamber, pop on the top, attach either the balloon adaptor or the whip adaptor, and begin vaping. When you use bags, just remember to turn the fan up to high so it fills the bags faster. Overall in the Ease of Use category, we have to declare the herbalAire the winner. Vapor quality refers to the density, flavor, and heat of the vapor that each unit produces. Each unit has pluses and minuses in these three categories, but there are clear winners in each. As far as taste goes, I personally think the herbalAire wins between the three. The vapor is tastier and smoother than either the Extreme Q or the Vapir Rise 2.0. However, the herbalAire tends to run on the hot side, and it has the hottest vapor of the three as well which is something to consider if you like cooler vapor. The Extreme Q has the coolest vapor, but also the least dense vapor of the three. The density of the vapor is lacking most likely due to the lower temperature that this vape tends to run at (even when the temperature is pretty high). As far as vapor density goes, the Vapir Rise 2.0 has the most dense vapor, which is due to the tighter pack that the chamber naturally has and the large capacity of the chamber. So for this category, there’s no clear winner. If you want the best taste, go with the herbalAire. If cooler vapor is what you like, go with the Extreme Q. And if you like thick, dense vapor, the Vapir Rise 2.0 will be what you’re looking for. Efficiency refers to how much material is used, how much is wasted, and how hard it is to get the active ingredients you want out of your material. The Extreme Q is probably the most efficient of the three (very close with the herbalAire though), especially when elbow packing. When you pack in the elbow, you are only packing about 0.2 to 0.3 grams into it. The herbalAire Elite and the Vapir Rise 2.0 both use 0.5 grams (or more with the Vapir Rise 2.0) for a normal pack. The Extreme Q also doesn’t waste any vapor when it is running, although extraction is slightly harder than with the herbalAire. The herbalAire uses more material than the other two, but it is by no means less efficient. One crucible can last twice as long as an elbow load in the Extreme Q, even though it uses less than twice the material. I believe this is due to the higher temperatures in the herbalAire extracting more from my herbs. It doesn’t waste any material either, especially after you replace the screen in the bag attachment with a finer one, which I recommend. The Vapir Rise is the least efficient by far. It has the largest bowl of the three, holding up to a gram or more. It just isn’t efficient with small amounts like the other vapes are. Each of these units are fairly small, with the herbalAire Elite being the smallest, the Extreme Q being the second smallest, and the Vapir Rise 2.0 being the largest (by a very small margin). Versatility, in this case, refers to how many people can use the vape at once and if it can use concentrates without having to make special modifications. Honestly, it’s a tie between the herbalAire Elite and the Vapir Rise 2.0. The herbalAire gets the vote because it can fill up to five bags at once, and the Vapir Rise 2.0 gets the vote because it is the only one that comes with a concentrate tray. The Vapir Rise 2.0 can also have four hoses attached at once, making it more group friendly (and, in my opinion, is the best group vape there is). The Extreme Q loses in this section because it can’t do concentrates or have multiple hoses or bags attached. The Extreme Q comes with a lifetime warranty on the heating element and a three year manufacturer’s warranty on parts and labor. The herbalAire Elite comes with a three year warranty. The Vapir Rise 2.0 comes with a two year warranty. Best Place to Purchase These Vaporizers? There are few places online that I like buying all of my vapes and accessories from. For these particular units, I recommend grabbing them from Vaporizer Chief. They offer some of the lowest prices in the industry and Vaporizer Chief even price matches if you find your unit cheaper somewhere else. Not only that, but they offer free shipping and other free gifts like a grinder with each purchase. You really can’t go wrong. Overall, it’s pretty close. All 3 of these units are great in their own way and all are versatile in the fact that you can use both bags and whips with them. If you want something efficient, with a great warranty, and want to keep odor at a minimum, go with the Extreme Q for $199. If you want something small, easy to use, and with the best tasting vapor of the three, go with the herbalAire for $199. 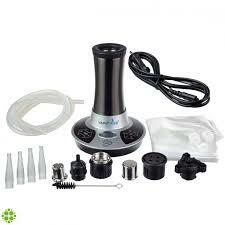 If you mainly vape in groups, and you like thick, dense vapor go with the Vapir Rise for $229. It is easily the best vaporizer for groups that I have come across, and it is so much better than both of the other vapes for group sessions. No matter which one you choose, know that you are getting a quality vape made from only the best materials. You will be happy with your purchase either way. The herbalaire line on the other hand is all plastic and Teflon and I’ve accidentally dropped it, left it outside in the winter all kinds of stuff. Lasted me years until my habit of yanking the cord out of the socket instead of holding the plug caught up to me. So I got it repaired for about 30 bucks, gave it to a buddy and got the elite. This was the exact comparison I was looking for! I think of the three I’m leaning towards the Rise. It really depends on what you plan on using them for. The Evo is a great vape, but it’s more of a 1 person unit. The Vapir Rise on the other hand is one of our favorites for group sessions. If you plan on vaping by yourself mostly, I’d say get the Evo. If you like vaping with friends, go with the Rise.